Here's a superb new Slots online game from iSoftBet. Delve into the world of Ancient Egypt and relive the tales and mythology in this lovable online slot game, Scrolls of Ra. Developed by the talented people behind iSoftBet, you'll feel like you've stepped out of reality and into a universe where you get the great pleasure of meeting the majestic Egyptian Gods. And not to mention the great opportunity of landing yourself with fortunes and gold at the end of each spin! But hold your horses, because, inside the sombre tombs that you will enter, there's a big chance that you will fall into secret rooms where you will be faced with bonus rounds that can leave you rich or empty-handed in this Online Slot Game. Even if you haven't heard of iSoftBet before, there is a big chance that you have played one of their games at least once in your lifetime. They are one of the top dogs in both the iGaming and online casino gaming industry, and that has been proven after they've been certified in many other European countries such as Spain, Italy, Belgium, Portugal, and the UK itself. Even though most of their products fall under the slot game category, iSoftBet made sure that every single one of their products has something unique to them. Something that no other casino game that you could think of would contain. That is why so many avid iGaming players are always eager to hear the latest release that they'd publish online. Whether you're a fan of classical slot games like Cherry Trio or advanced products like Forest Mania, you can be sure will win more than what you've originally bet in any one of iSoftBet's games! If you love promo's, get the best Slot promotions today. 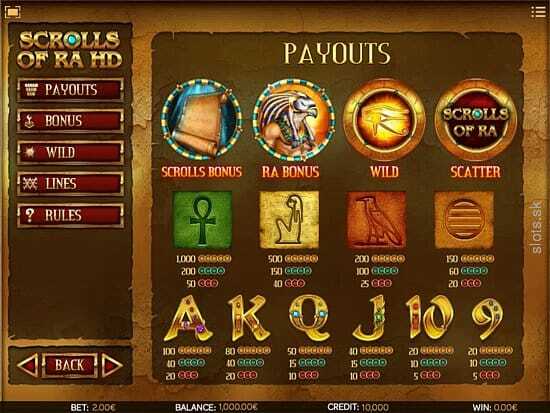 Layered on a 5 reel set on 3 rows, with all of the coin, lines and auto spin buttons that you can manipulate at the bottom of the screen, Scrolls of Ra aims to keep you on your tiptoes while you enter inside the sacred tombs that home the spirit of the mighty Egyptian Gods. 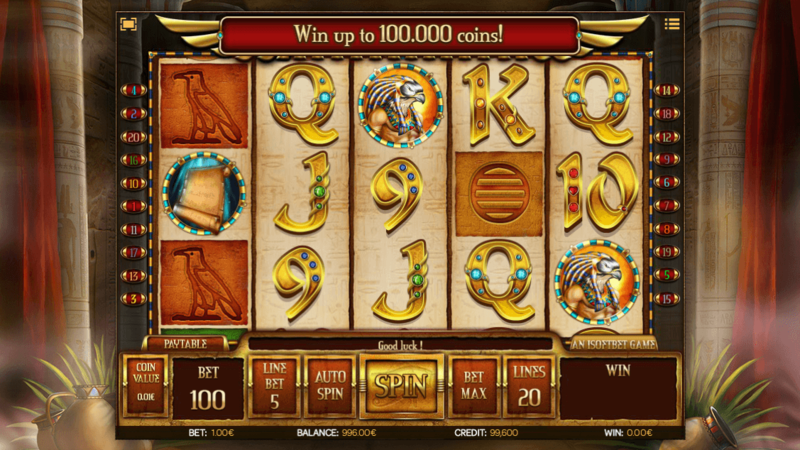 Eye of Horus WILD: If landed on the 2nd, 3rd, and 4th reel, you'll activate free spins on the game. Obelisk SCATTER: Find yourself with 3 of these symbols on the reels and you'll win instant prizes. Scarab SCATTER: Land 3 of these symbols on the reels and you'll trigger the Scrolls of Ra Bonus Round. Scrolls of Ra Bonus Round: If 3 scroll icons appear on the 1st, 3rd, and 5th reels, you'll be transported to a secret room where you have to choose which one of the 3 scrolls with give you the highest jackpot in the game. The number of bonus rounds and multiple icons can be bewildering for any adventurer to endeavour, but the soothing sound of traditional Egyptian music will be enough to reassure you that the Gods only want to shower you in fortune. But this game is only for the brave and the audacious. If you believe that you are brave and audacious, make the time right now to sit down and turn on Scroll of Ra on your device!